Study participants were chosen from a pool of over 30 elite Northern California cyclists. After contacting the original 30-plus cyclists, researchers interviewed all who were interested in participating, ultimately selecting 12 who met the criteria for the study. All selected cyclists, who ranged in age from 17 to 40, met the following qualifications: They were “Category II or above, in race-ready shape and free of illness or injuries.” Cyclists of both genders participated. Of the 12 cyclists selected, five completed the study, with seven abandoning the study before or during the testing period. Care was taken to ensure that no cyclist had ridden the day of the test and that all were in good condition. Participants were physically segregated from one another to prevent a competitive element from biasing test results. A coin-toss determined whether each rider rode taped or untaped in the first session. Uniform recovery periods were provided for all athletes. Other possible limitations the study mentions are “the strong placebo effect of taping that has been well documented in subjects with patellofemoral joint pain…” (a factor which the researchers admit could have affected their results) and the prior knowledge the study subjects may have had about RockTape and its claims, which could also have “psychologically contaminated” the results. The small sampling of cyclists completing the study might also be considered a weakness. 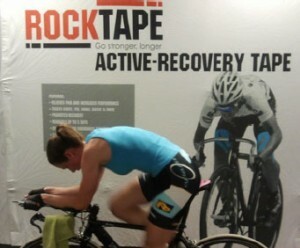 However, since each cyclist’s taped results were measured against his/her own untaped results and were easily quantifiable based on specific numerical measures, this would seem to provide a reasonable level of reliability in comparing the taped/untaped conditions, barring the psychological effects mentioned above. Despite its obvious limitations, this study appears to provide reasonably credible support for the efficacy of RockTape for performance enhancement.